Ever wanted to learn more about Walt Disney, the history of the theme parks, “behind the scenes” details about your favorite attractions? Then you need to join the Disney Driven Life Book Club! Over the next few months, we’ll be reading a variety of books to learn more about all aspects of the Disney brand and history. 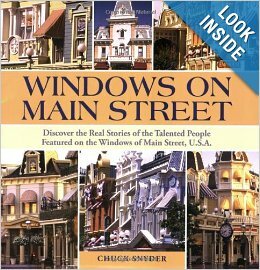 We’re kicking off the first month with an easy read: Windows on Main Street: Discover the Real Stories of the Talented People Featured on the Windows of Main Street USA. Head out this weekend and get yourself a copy or order it now on Amazon so you can bring a little Disney to your life as you read over the next couple of weeks. You can also check your local library if you want to check the book out before spending the money on it. As you’re reading, please join us on Thursday, March 20 at 9:00 EST for a Twitter party to discuss the book. We look forward to hearing your thoughts! As the date gets closer, we’ll send out a reminder or two so you don’t miss it. If you’ve got an idea for a future Book Club selection, leave a comment below and we’ll add it to the list of possibilities.